WHY CORE and HOW CAN CORE HELP YOU? Technology is developing, so are recruitment methods. Especially over a decade technology has played an increasingly larger role in the recruitment industry. By looking at these technological progressions it's easy to make out how hiring methods have transformed immensely. Advertisement- which apparently acted as a source of recruitment has given away to the whole new concept of recruitment consultancies. Advertising job openings in newspapers, televisions, magazines or pamphlets considered as effective modes of recruitment few years back is slowly losing its significance. The main reason behind this is time has become the most important thing today. Any process that incorporates a huge amount of time is a complete no in today's technological world. Besides, you need to pay your fees in advance when hiring through these advertising mediums and after all this you are assured with no guaranteed results. Fortunately, the contemporary workplace has given rise to the necessities of recruitment the best means to get the labour force that you want, at the same time ensuring that you obtain only the finest and the most dexterous employee in the work pool to suit your definite job opening requirements. FIND EMPLOYEES EASILY: We make the hiring process easier by sourcing candidates, filtering them through an intense interview process, assessing their skill and finally sending the cream of the crop to the company. SAVE MONEY: Instead of paying unreasonably high prices just to circulate advertisements through newspapers, televisions, magazines and all other forms of media just to advertise for vacancies, followed by spending more economy in human resources to sort out various resumes and applicants, pay the services to CORE to get the best qualified employees as needed. If the prices paid for ads and human resources are compared against the fee paid for CORE services, it can be openly understood how much money one is saving. Unlike advertising or other modes of recruitment payment is accepted only after the requirement is fulfilled with full satisfaction. 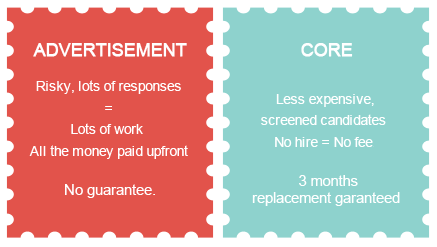 TIME SAVER: CORE entitles to lessen the amount of applicants that one would get and have to monitor through, compared to posting various advertisements in different forms of media. CORE only sends a selected pool of employees that are assured to platform with all the required skills. © Core Careers 2018. All Right Reserved.